A spice is a seed, bark, fruit, root, berry or vegetable substance used to flavor, color and preserve food. It is a flavorful dried or ground plant food. It differs from herbs in a sense that herbs are usually the leafy part of some plants and used as a flavoring or garnish in dishes. There are a lot of spices used in many cuisines. Not only that spices are used in cooking, they are also used as medicine, cosmetics and perfume production. With the many varieties of spices, they can be categorized according to their source of plant part: Leaves, fruits or seeds, roots and bark. Leaf types include bay leaf, rosemary and thyme. Examples of fruits or seeds spices are coriander, fennel, mustard, nutmeg and black pepper. The roots or bulbs type include garlic, turmeric and ginger. While the bark spices are cinnamon and cassia. Spices are natural ingredients to add flavor, aroma and color to Paleo meals. They are used in preparation of soups, sauces and sometimes used as main ingredient in dishes like curries. Most spices boast antibacterial and anti-inflammatory properties. Though spices, like herbs, are used in small amounts, regularly incorporating them to meals can help obtain optimum health. There are many types of spices used in cooking but below are the top favorites in the Paleo diet. This powerful spice is made from dried and ground cayenne peppers. Cayenne is known to be an appetite suppressant and metabolism booster because of its capsaicin content that can increase blood flow and metabolism and reduce hunger. Cinnamon works well with sweet and savory dishes. It is common in pies, stews and baked products. Cinnamon contains polyphenols which help boost level of certain proteins responsible for glucose transport, insulin and inflammatory responses. It is also a great sourse of fiber, magnesium, calcium and antioxidants. Also referred to as poor man’s saffron, curcumin is a mildly woody spice popular in Indian, Persian and Thai cuisines. It contains curcumin, an active ingredient that can aid in preventing diseases like Parkinson’s, diabetes, arthritis, heart illnesses and even cancer. Turmeric is the spice that gives curry its golden color. Its active ingredient is also curcumin, an anticancer agent and known to fight inflammation. Turmeric is one of the most traditionally used medicine in India. An ancient spice used for its healing properties, ginger is commonly used as digestive aid. It can relieve nausea, bloating, heart burn and acid reflux. Fresh or dried, ginger is rich in antioxidants and has anti-inflammatory properties. It is common in soups and stews and can be used as tea. This fragrant spice has a pungent and sweet taste. It is used in curries, milk-based preparations, cakes and desserts. Cardamom is known to treat indigestion. It contains volatile oils cineol, terpinene, limonene, sabinene and terpineol which have therapeutic properties. Garlic is one of the most common spices used. It comes in powdered or fresh forms. It works well with many dishes. The aroma of garlic comes from its sulfur compound allicin which gives its medicinal properties. Garlic is known to help lower risk of heart diseases and reduces cholesterol levels. Spices are common in Paleo dishes not only because of its aroma and flavor but because of its health benefits. They contain zero carbs, sugar and fat but rich in nutrients. They may be consumed in small quantities but the trace amounts of vitamins, minerals and antioxidants they have make an important contribution to a healthy diet. Spices contain plant-derived chemical compounds which are proven to prevent diseases and promote health. Aside from their culinary purposes, spices have been used since ancient times for their antibacterial, anti-inflammatory, anti-flatulent and carminative properties. Many spices have the ability to improve blood sugar level and blood lipids. Cinnamon is an example. It can also regulate the cholesterol levels in the body, lowering the risk of heart diseases. 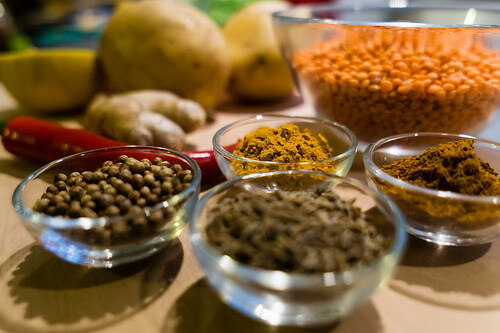 Spices can help prevent nutritional degradation of food during storage. Turmeric is a spice that has the ability to improve gut flora function. It can relieve symptoms of IBS and other digestive-related problems. Most spices have been used as remedy for certain illnesses. One is ginger which is used to treat nausea. Capsaicin in cayenne has metabolism-boosting effects and suppresses hunger. Spices don’t easily spoil but it loses its strength overtime. The chemical compounds found in spices are sensitive to oxidation. It is important to properly store spices to retain their potency. Buy fresh and whole spices whenever possible. Try to source out from local market instead of groceries to make sure the spices are fresh. It’s much cheaper too. Store spices in air tight containers away from heat. Keep them in cool dark place. Whole spices keep the longest so you can grind your spices each time you need them for a longer shelf life. The Ultimate Paleo Guide. Are Spice Paleo?